An Artificial Kidney of the Future? are two bean-shaped organs, one on each side of the backbone. but receive 20–25% of the total arterial blood pumped by the heart. Each contains from one to two million nephrons. Bowman's capsule. Located at the closed end, the wall of the nephron is pushed in forming a double-walled chamber. Proximal convoluted tubule. Coiled and lined with cells carpeted with microvilli and stuffed with mitochondria. Distal convoluted tubule, which is also highly coiled and surrounded by capillaries. Collecting duct. It leads to a calyx, one of many small chambers from which urine drains into the pelvis of the kidney from where it flows through a ureter to the bladder and, periodically, on to the outside world. The Bowman's capsules are packed in the cortex of the kidney, the tubules and collecting ducts descend into the medulla. reclaiming the needed amounts of useful materials. Surplus or waste molecules and ions are left to flow out as urine. almost all of the 180 liters of water that entered the tubules. 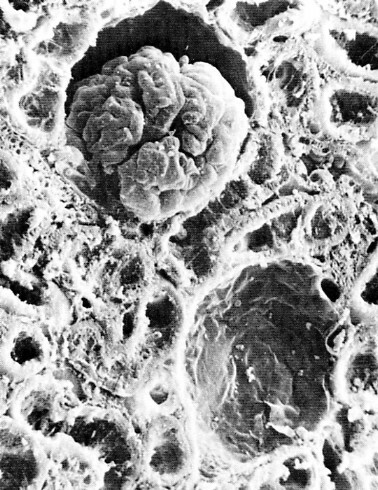 Blood enters the glomerulus under pressure. This causes water, small molecules (but not macromolecules like proteins) and ions to filter through the capillary walls into the Bowman's capsule. This fluid is called nephric filtrate. As the table shows, it is simply blood plasma minus almost all of the plasma proteins. Essentially it is no different from interstitial fluid. Composition of plasma, nephric filtrate, and urine (each in g/100 ml of fluid). These are representative values. The values for salts are especially variable, depending on salt and water intake. 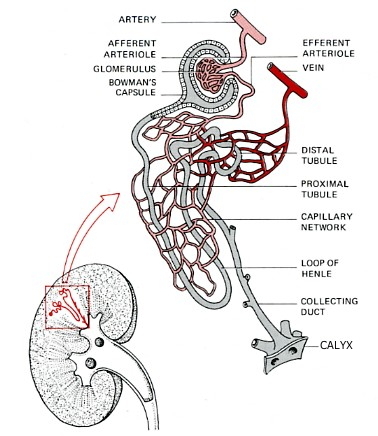 Nephric filtrate collects within the Bowman's capsule and then flows into the proximal tubule. Here all of the glucose and amino acids, >90% of the uric acid, and ~60% of inorganic salts are reabsorbed by active transport. The active transport of Na+ out of the proximal tubule is controlled by angiotensin II. The active transport of phosphate (PO43-) back into the blood is regulated (suppressed) by both the parathyroid hormone and fibroblast growth factor 23 (FGF-23). As these solutes are removed from the nephric filtrate, a large volume of the water follows them by osmosis (80–85% of the 180 liters deposited in the Bowman's capsules in 24 hours). 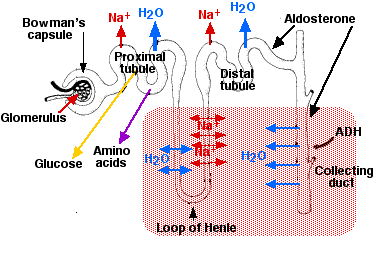 As the fluid flows into the descending segment of the loop of Henle, water continues to leave by osmosis because the interstitial fluid is very hypertonic. This is caused by the active transport of Na+ out of the tubular fluid as it moves up the ascending segment of the loop of Henle. In the distal tubules, more sodium is reclaimed by active transport, and still more water follows by osmosis. Final adjustment of the sodium and water content of the body occurs in the collecting ducts. Although 97% of the sodium has already been removed, it is the last 3% that determines the final balance of sodium — and hence water content and blood pressure — in the body. The reabsorption of sodium in the distal tubule and the collecting ducts is closely regulated by the synergistic action of the hormones vasopressin and aldosterone. The hypertonic interstitial fluid surrounding the collecting ducts provides a high osmotic pressure for the removal of water. Insertion of aquaporin-2 channels requires signaling by vasopressin (also known as arginine vasopressin [AVP] or the antidiuretic hormone [ADH]). Vasopressin binds to receptors (called V2 receptors) on the basolateral surface of the cells of the collecting ducts. Binding of the hormone triggers a rising level of cAMP within the cell. This "second messenger" initiates a chain of events culminating in the insertion of aquaporin-2 channels in the apical surface of the cell. The release of vasopressin (from the posterior lobe of the pituitary gland) is regulated by the osmotic pressure of the blood. turns on the vasopressin → V2 receptors → aquaporin-2 pathway. As little as 0.5 liter/day of urine may remain of the original 180 liters/day of nephric filtrate. The aquaporin-2 channels are taken back into the cell by endocytosis. The result: a large volume of watery urine is formed (with a salt concentration as little as one-fourth of that of the blood). Inheritance of two mutant genes for the vasopressin receptor (V2) [in females; because the gene is X-linked, only one does it for males]. Inheritance of one (for dominant mutations) or two (for recessive versions) mutant genes for aquaporin-2. The most obvious effect of this rare inherited disorder is extremely high blood pressure (hypertension). It is caused by a single mutant allele (therefore the syndrome is inherited as a dominant trait) encoding the aldosterone-activated sodium channel in the collecting ducts. The defective channel is always "on" so too much Na+ is reabsorbed and too little is excreted. The resulting elevated osmotic pressure of the blood produces hypertension. Although urine formation occurs primarily by the filtration-reabsorption mechanism described above, an auxiliary mechanism, called tubular secretion, is also involved. The cells of the tubules remove certain molecules and ions from the blood and deposit these into the fluid within the tubules. Example: Excess hydrogen ions (H+) are combined with ammonia (NH3) to form ammonium ions (NH4+) and transported to the cells of the collecting ducts. Here the NH4+ dissociates back into ammonia and H+. Both are then secreted into the fluid within the collecting ducts (the protons by active transport). Tubular secretion of H+ is important in maintaining control of the pH of the blood. When the pH of the blood starts to drop, more hydrogen ions are secreted. If the blood should become too alkaline, secretion of H+ is reduced. In maintaining the pH of the blood within its normal limits of 7.3–7.4, the kidney can produce a urine with a pH as low as 4.5 or as high as 8.5. Excess potassium ions (K+) are also disposed of by tubular secretion. While we think of the kidney as an organ of excretion, it is more than that. It does remove wastes, but it also removes normal components of the blood that are present in greater-than-normal concentrations. When excess water, sodium ions, calcium ions, potassium ions, and so on are present, the excess quickly passes out in the urine. On the other hand, the kidneys step up their reclamation of these same substances when they are present in the blood in less-than-normal amounts. Thus the kidney continuously regulates the chemical composition of the blood within narrow limits. The kidney is one of the major homeostatic devices of the body. as well as the enzyme renin. The artificial kidney uses the principle of dialysis to purify the blood of patients whose own kidneys have failed. The left portion of the figure ("Dialysis unit") shows the mechanism used today in artificial kidneys. Small molecules like urea are removed from the blood because they are free to diffuse between the blood and the bath fluid, whereas large molecules (e.g., plasma proteins) and cells remain confined to the blood. The bath fluid must already have had essential salts added to it to prevent the dangerous loss of these ions from the blood. Note that blood and bath fluid flow in opposite directions across the dialysis membrane. This "counter-current" exchange maintains a diffusion gradient through the entire length of the system. An anticoagulant is added to the blood so it will not clot while passing through the machine. The anticoagulant is neutralized as the blood is returned to the patient. In an attempt to solve these problems, a research team at the University of Michigan is experimenting with adding a "Bioreactor unit" (above) to the dialysis unit. The bioreactor consists of many hollow, porous tubes on the inner wall of which is attached a monolayer of proximal tubule cells (derived from pigs). The dialysis bath fluid passes through the lumen of the tubes where molecules and ions can be picked up by the apical surface of the cells. Discharge of essential molecules and ions (as well as hormones) at the basolateral surface of the cells places these materials back in the blood (just as the proximal tubule cells in the nephron normally do). So far, all the testing has been done using dogs, but the results seem promising. The ideal alternative to long-term dialysis is transplantation of a new kidney. The operation is technically quite easy. 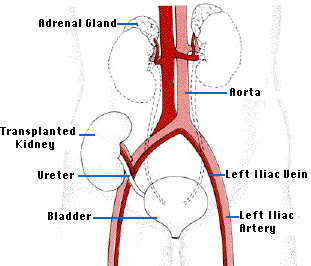 The recipient's diseased kidneys are usually left in place, but the renal arteries and veins are tied off except for the branches supplying the adrenal glands. The major problems is the shortage of donors suitably matched for histocompatibility molecules so as to avoid the problem of graft rejection by the recipient's immune system that — unless the donor and recipient are identical twins — "sees" the kidney as "foreign". Link to discussion of organ transplants.